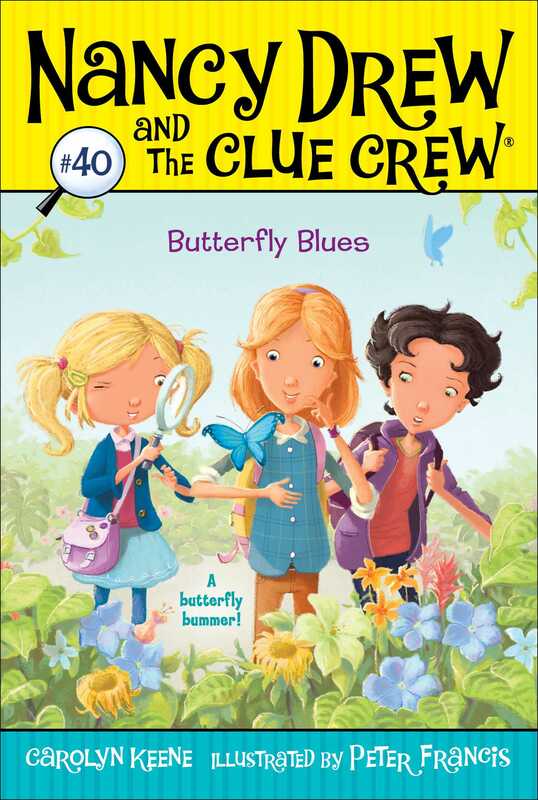 In this Nancy Drew and the Clew Crew adventure, Nancy and her friends must track down a beautiful—and very rare—butterfly when it goes missing from the new butterfly museum. Nancy, Bess, and George can’t wait to check out Flutter House, an awesome new museum that’s all about butterflies! The girls are thrilled when they get to see the beautiful creatures up close and personal. But soon after their class leaves, the rarest butterfly, a Blue Morpho, goes missing! It’s up to the Clue Crew to get the valuable butterfly back safely. But with a long suspect list and not many clues, it’s going to be a tough case for Nancy and her friends. “This class trip is going to be awesome!” eight-year-old Nancy Drew exclaimed. “Super awesome!” Bess Marvin agreed. “Totally super awesome!” George Fayne added. The three best friends were very excited to visit Flutter House, the cool new butterfly exhibit in their town. Thanks to their third-grade teacher, Mrs. Ramirez, their wish was about to come true! “I heard there are hundreds of butterflies inside Flutter House!” Quincy Taylor said as the class followed Mrs. Ramirez to the Flutter House building. “How do you think they got hundreds of butterflies in one place?” Nancy wondered as she brushed her reddish-blond bangs aside. “Hundreds of butterfly nets!” Quincy joked. Mrs. Ramirez stopped the class in front of the main entrance. The building was shaped like a caterpillar with a glass dome as its head! Nancy rolled her eyes. Antonio was the class pest. He was always shouting before raising his hand. “Correct, Deirdre,” Mrs. Ramirez said with a smile. Deirdre glared at Antonio under the brim of her big flowered hat. Nancy, Bess, and George knew they weren’t invited to Deirdre’s party. Deirdre was always mad at the girls for something. This time she was mad at Nancy for getting the class job she wanted—watering the plants. Instead Deirdre got the worst job of all—cleaning the stinky turtle tank. “You have a favorite hat?” Deirdre said, looking George up and down. George was wearing her usual faded jeans and a sweatshirt. “George!” Bess groaned, rolling her eyes. Nancy giggled. She had been friends with Bess and George since kindergarten and still couldn’t believe they were cousins. Bess was totally fashion forward. George was fashion backward and proud of it. Bess loved building gadgets. George loved gadgets too, as long as they were electronic. She loved her mom’s minitablet, and she even was allowed to borrow it today! Deirdre turned her nose up at the girls. She shifted her big tote bag on her shoulder, then walked over to her best friend, Madison Foley. “I don’t like tea anyway,” Bess whispered, flipping her long blond hair. “Hey, boys and girls!” a voice called out. Everyone turned. A man not much older than college-age was walking over. He wore a Flutter House polo shirt and a big smile. Nancy and her classmates copied the move Josh was doing. They pressed their hands together and waved their fingers like butterfly wings. “Me, me, me!” Harper shouted. She raised her hand high in the air while hopping up and down. Nancy liked Harper, the new girl in class who loved butterflies. She wore a denim jacket with butterfly patches. And a different color butterfly barrette every day! “I guess you like butterflies!” Josh said to Harper. Nancy smiled at the word “spy.” She, Bess, and George weren’t really spies, but they were detectives. They loved solving mysteries in their town of River Heights. They even had their own detective headquarters in Nancy’s room. “How does it work?” Josh asked. Josh then pointed to Antonio eating a big red apple left over from lunch. “And no food, either,” Josh said. Everyone lined up while Josh opened the door. Nancy saw Antonio slip right behind Deirdre. She then saw something that made her frown. Antonio had dropped his half-eaten apple core into Deirdre’s bag! “You better not!” Antonio warned before pushing his way to the front of the line. “That apple is going to turn all brown and mushy in Deirdre’s bag,” Bess said, wrinkling her nose. “Yeah,” George said with a smile. The girls forgot about Antonio as they filed into Flutter House. They followed Josh down a long hallway decorated with butterfly posters and mobiles. Also in the hall was the gift shop. Nancy could see fun butterfly toys and colorful butterfly-shaped pillows through the glass window. At the end of the hall was a room. When they were all inside, the kids looked around. Where were the butterflies? “This room keeps the butterflies from flying outside the building,” Josh explained. “You mean escaping?” Tommy asked, wide-eyed. Josh walked to the back wall and lifted a curtain. “See for yourselves,” he said. Everyone started oohing and ahhing as dozens of colorful butterflies soared over their heads or rested on plants and flowers. “It feels like summer in here!” Nancy said. “What do butterflies eat, Josh?” Mrs. Ramirez asked. “Most butterflies drink the nectar from flowers or fruit,” Josh said. “I knew that!” Harper declared. A yellow-and-orange butterfly landed gently on Nancy’s shoulder. “There’s a saying that if you make a wish on a butterfly, it will come true!” Bess said excitedly. “I didn’t know that!” Harper admitted. Nancy thought of some wishes but picked just one. She squeezed her eyes shut, then made her secret wish. When Nancy opened her eyes, everyone was pointing to Josh. An even bigger butterfly had landed on his shoulder—a big blue butterfly! “Meet our only blue morpho butterfly,” Josh said. Nancy’s eyes popped wide open as a sheer white butterfly net dropped over Josh’s head and shoulders.